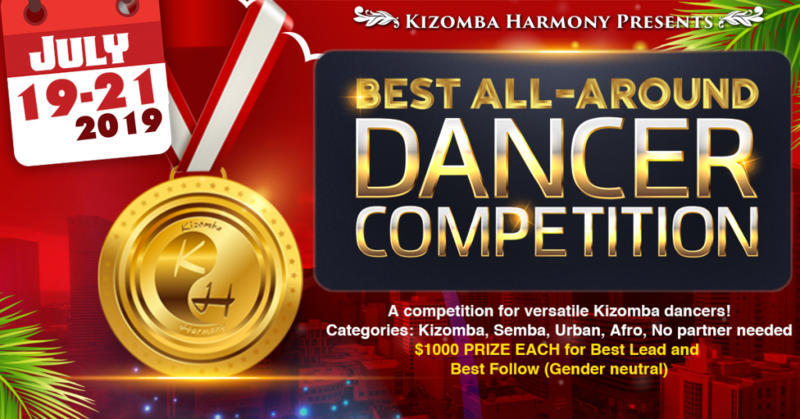 Kizomba Harmony Presents… the Best All-Around Dancer Competition! A Kizomba competition like no other… the Best All-Around Dancer (BAAD) competition! This competition is open to anyone who wants to compete. Represent your city, your state, your country, your continent! Don’t have a partner? No worries, you won’t need one for this competition. This one-of-a-kind competition will take place in Houston, TX the weekend of July 19-21, 2019. Save the date and start getting ready now! We’re going to find out who’s BAAD! The Best All Around Dancer Competition is an international competition that focuses on social dance skills, versatility, musicality, and African dance foundation. The format is “jack and jill” for the three partner dancing categories Kizomba, Semba, and Urban, and solo for the Afro category. Each phase consists of 2 minute heats to be described in further detail in Category overview section. Competitors will draw their partner for the category 15 minutes prior to competition and will have 15 minutes to get acquainted and practice prior to competing. Competitors will draw lots to determine their partner prior to every category. If you draw someone that you have already partnered with in that stage of competition (eliminator or final) you will redraw but partnering in one of the final heats with someone you have danced with during the eliminator section is allowed. Competitors will be judged on their social dance ability and African dance foundation in four categories. For the Kizomba portion, which will be two minutes for each couple, the competitors will be judged primarily on connection, lead/follow ability, movement quality, musicality, style, and floorcraft. For the entire 2 minutes of the Kizomba portion, each competitor couple must stay within the 4 foot square delineated area. Floorcraft is very important. For the first minute, the competitors must dance in closed position without using an arm frame, and must do closed position basics (weight transfer in place, side basic, virgula, estrela, etc.) during this portion without using arms, showcasing their lead/follow ability and connection. After one minute, a bell will toll, at which point the competitors may use their arms and proceed to impress the judges with their creativity and musicality, but must remain within the 4 foot square area. Any competitor stepping outside of the 4 foot square area during the Kizomba portion will have points deducted from their total score. During the Kizomba portion, each competitor couple must stay connected without breaking away out of closed or open position. There should be no “Semba Show” style tricks, etc., during the Kizomba portion, as the Kizomba portion especially is designed to emphasize the social aspect of dancing. Hanging on your dance partner, or doing overly exaggerated tricks and movements not conducive to social dancing will result in competitors having points deducted from their total score. “Urban” is an umbrella term we use to describe the many personal styles and related marketing terms that have developed and are developing, including but not limited to: Urban Kiz, Kizomba 2.0, Urban Kizomba, Tarraxo, etc. We define Urban at its highest level as a strong Kizomba/Semba base with an added musicality toolbox and an openness to (but not requirement of) fusions and related creativity, and therefore the rules of the Urban portion are designed to promote and reward competitors who exemplify this definition. The Urban portion of the competition will be 2 minutes for each competitor couple. The emphasis in the Urban portion will be on connection, musicality, movement quality, creativity, style and floorcraft. The Urban portion will take place within two delineated areas, a 4 foot square area, and an 8 foot square area. In the first minute of the Urban portion, the competitors must stay within the 4 foot square area, and in the second minute the competitors may (and are encouraged to) use the entire 8 foot square area. In the first minute of the Urban portion, the competitors should showcase their connection, movement quality, and musicality in closed position. During this minute, Tarraxa/Tarraxo/Tarraxinha well as any Urban style or combination of styles can be used to interpret the music. The bell will toll once this minute is up. Once the bell tolls and the second minute starts, the competitors may no longer use Tarraxa/Tarraxo/Tarraxinha and must move outside of the 4 foot square area at some point during the second minute (without stepping outside of the 8 foot square area). During the second minute the competitors should showcase their advanced moves, tricks, musicality, and creativity and use the full space given. Points will be deducted for competitors who step outside of the 4 foot square area during the first minute, who step outside of the 8 foot square area during the second minute, and who do Tarraxa/Tarraxo/Tarraxinha after the first minute. As we are firm believers that Urban styles work best when based on a strong African dance foundation, the judging criteria will reward competitors who express the creativity and musicality of Urban without deviating overmuch from Kizomba/Semba foundation. Therefore, we strongly discourage competitors from sacrificing their movement quality and connection for the sake of attempting to achieve a certain “look”, as the judges will be instructed to deduct points therefor. We believe it is important to distinguish social Semba from Semba “Show”, and the rules for the Semba portion are meant to do so, giving competitors a chance to showcase their social Semba skills as well as their creativity and showmanship. The Semba portion of the competition will be 2 minutes for each competitor couple. The emphasis in the Semba portion will be on connection, musicality, movement quality, creativity, energy, style, and floorcraft. The Semba portion will take place within two delineated areas, a 4 foot square area, and an 8 foot square area. In the first minute of the Semba portion, the competitors must stay within the 4 foot square area, and in the second minute the competitors may (and are encouraged to) use the entire 8 foot square area. In the first minute of the Semba portion, the competitors should showcase their connection, movement quality, creativity, and musicality by dancing social Semba in closed and open position. During this minute. In this minute, tricks and footwork suitable for social dancing is allowed, but larger, exaggerated “Show” tricks and movements (hanging overmuch on your partner, exaggerated dips and leans, breaking apart, etc.) are not allowed in the first minute. As Semba is at its core a social, musical, connected dance (as opposed to a “Show” dance), musicality will be especially important in the first minute. The bell will toll once this minute is up. Once the bell tolls and the second minute starts, the competitors may (and are encouraged to) move outside of the 4 foot square area (without stepping outside of the 8 foot square area). During the second minute the competitors should showcase their advanced moves, tricks, musicality, footwork, and creativity and use the full space given. Breaking apart to do mini-”solos” is also allowed ONCE during the second minute, but ONLY for an 8 count, at which time the competitors must reconnect. This is your time to pull out all your Semba “Show” moves, tricks, and style. Points will be deducted for competitors who step outside of the 4 foot square area during the first minute, who step outside of the 8 foot square area during the second minute, who do Semba “Show” moves and/or break apart in the first minute, and who break apart for more than an 8-count in the second minute. We strongly believe in the importance of African dance foundation, that learning different African dances is of great benefit in developing well-rounded Kizomba dancers, so the Afro portion is designed to promote this belief and foster a greater interest in learning more about African culture through dance. Each competitor will compete in the Afro portion as solo competitors, and the Afro portion will last 1 minute for each competitor. Competitors will be judged on their musicality, energy, movement quality, and African dance foundation. Competitors may choose any dance originating in Africa (Afrohouse, Kuduro, Soukous, Coupe-decale, etc.) for the Afro portion. Competitors must submit their music and name of the dance they will be performing one week before the competition begins, to give the organizers and judges time to properly prepare. Competitors are encouraged to practice and choreograph their Afro routine in advance for the greatest opportunity to impress the judges. Points will be deducted for competitors who have clearly not prepared for the Afro portion, and who do not appropriately dance to the music. The Afro portion is the only solo portion and this is the time for the competitors to shine on their own merits, so above all, we encourage the competitors to make sure their energy is through the roof and have FUN! The Best All Around Dancer Competition is open to dancers of all nationalities, cultures, and countries and open to professional and amateur dancers both during the elimination phase and finals. The 2019 competition will be held in Houston, Texas, USA, June 28, 2018, eliminator round June 29, 2018 finals. A dancer must be at least 18 years of age. A dancer can compete as a lead or follow role but must continue in that role for the full competition for elimination and finals. To advance to the final competition, a dancer must compete and successfully make it through the eliminatory phase. Waiver of liability must be signed prior to competition. Decisions and ratings of the judging panel are final without appeal. Our judging panel evaluates dancers based on dance ability not costumes, therefore we will require all competitors to wear a uniform color scheme for the partner dancing portions of the competition. For the afro section, you can wear whatever you feel comfortable solo-dancing in. OF NOTE there will be NO rating or additional points for costumes. Points will be docked if your clothing inhibits your movement or that of your partner. Points will be docked and you may be asked to change if your clothing is deemed offensive with the discretion up to the judging panel. For the partner dancing portion both males and females are to wear a black top and black bottoms that are fitted and we encourage you to wear fabric that stretches and dries quickly for your comfort and that of your partner’s. To allow the judges to better see your movement wear an unobtrusive sash or belt around your waist in a color that is not predominantly black. Shoes should also not be black to allow for footwork to be seen.